The Adirondack Lakes Center for the Arts's annual Adirondack Lakes Summer Theatre Festival kicked off this summer with Lee Blessings' A Walk in the Woods and now continues with the annual free Shakespeare in the Park. 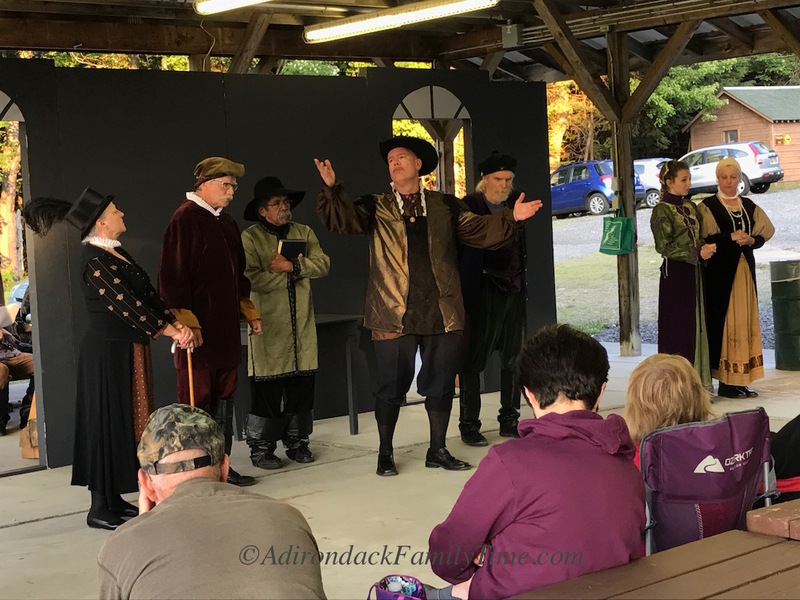 With a mixture of professional and regional actors, this year's Shakespearean pick The Merry Wives of Windsor is a hilarious romp for all ages. Set outside, the actors utilize their surrounding and a simple stage setting to create the atmosphere of various areas of Windsor, England. Director Anne Vaccaro adapted Shakespeare's play to be under an hour with no intermission. Vaccaro makes this version of The Merry Wives of Windsor a fast-paced, fun version that has the audience laughing in their seats. The language is simplified from what I remember of this play, but she kept true to the form. The ensemble cast were fast on their feet and able to keep the pace of this lighthearted farce. The play focuses on two wealthy families of Windsor, the Fords and Pages and their entourages. 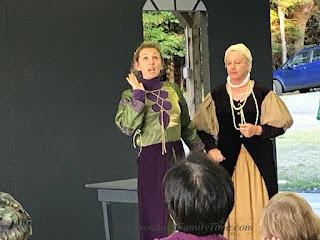 When Sir John Falstaff (Jayson Grigsby) attempts to seduce the two wealthy wives to alleviate some of his financial issues, When the they discover his scheme, Mistress Ford (Hannah Jay) and Mistress Page (Robin Jay) plot ways to embarrass and expose Falstaff's true colors. A jealous husband, Master Ford (George Cordes) creates more mischief when he believes his wife is being unfaithful. At that same time Master Slender (Matthew Varden) and Mistress Shallow (Karen Munoz) scheme to marry Slender to Anne Page (Maia Pugh), but Anne has other plans. A mental tug-of-war takes place as other Windsor citizens vie for Anne's hand. The play is a pure farce with all its intricate layers. It's a fun-filled hour of live theatre that is perfect for all ages. Enjoy this free Shakespeare in the Adirondack Park! 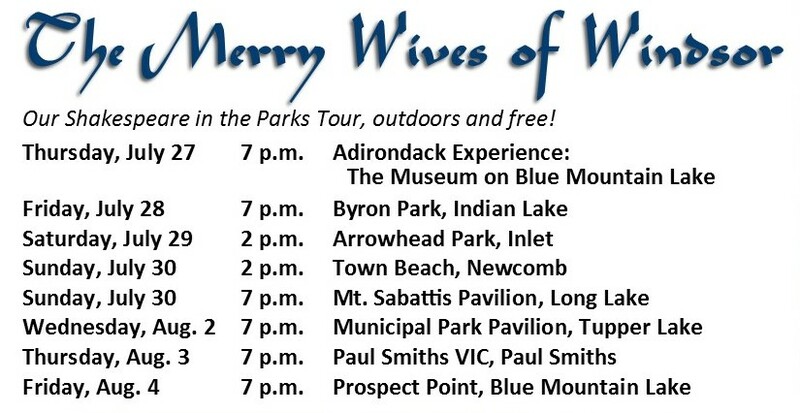 The three remaining performances are set for Tupper Lake's Municipal Park Pavilion on Wednesday, August 2, Paul Smith's College VIC on Thursday, August 3 and Blue Mountain Lake's Prospect Point on Friday, August 4. Call The Art Center at 518-352-7715 with any questions. All performances start at 7 pm and are free. Chairs, bug spray, and blankets are recommended for these outdoor performances, though some seating is available. Enjoy! 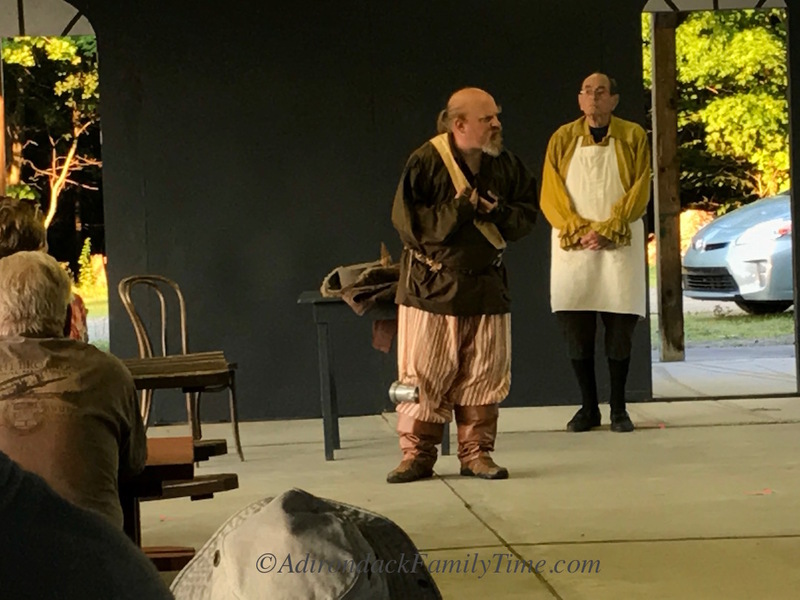 Next on the busy schedule for the Adirondack Lake Summer Theatre Festival is the August 12 Great Arts Cabaret with songs from the upcoming performance of Gilbert and Sullivan comedic opera The Pirates of Penzance. Tickets are $10 for the 7:30 pm performance at the Blue Mountain Lake Arts Center. 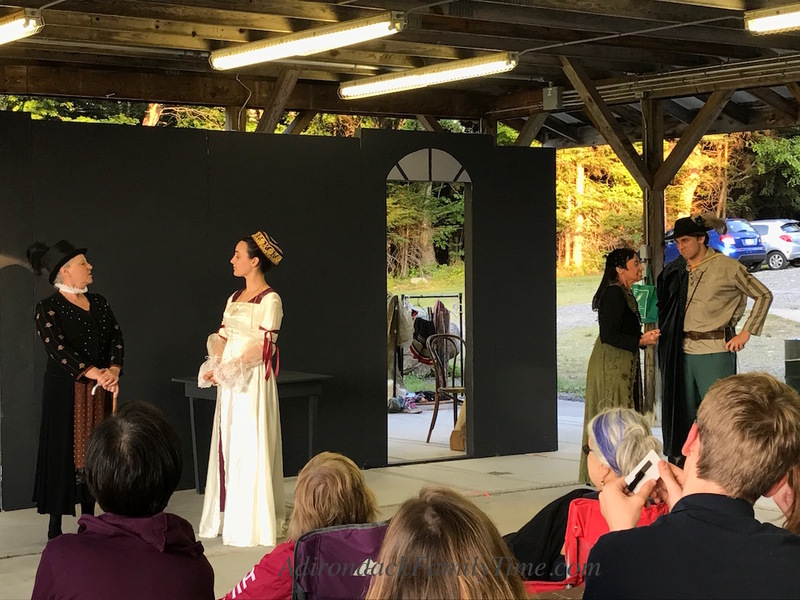 \The last performance piece for the Adirondack Lakes Summer Theatre Festival is The Pirates of Penzance. The Gilbert and Sullivan comedic opera was first performed in New York City in 1879. Since that time it has been performed all over the world, and is now coming to the Adirondacks. With a limited run of four performances, The Pirates of Penzance will take place on Thursday, August 17 at Blue Mountain Lake's The Art Center, Friday, August 18 at North Creek's Tannery Pond Center, Saturday, August 19 at Saranac Lake's High School and Sunday, August 20 at Old Forge's Strand Theatre. Tickets are $15 for Art Center members, $20/non-members, and $8/children (eight and under). All performances are at 7:30 pm except the Sunday matinee.